Haruki Murakami viewing the iconic the Latrobe Reading Room. 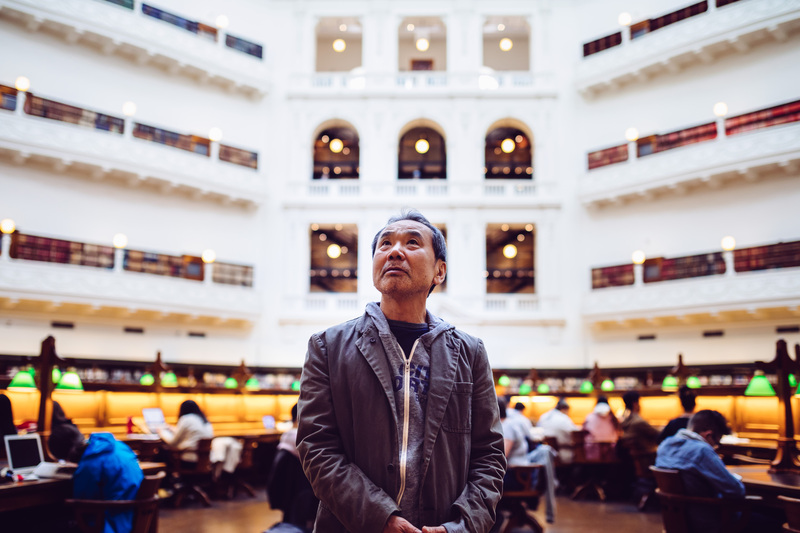 State Library Victoria was delighted to host a special guest recently – internationally acclaimed Japanese author Haruki Murakami, who visited the library for a special behind-the-scenes tour on a recent trip to Melbourne. 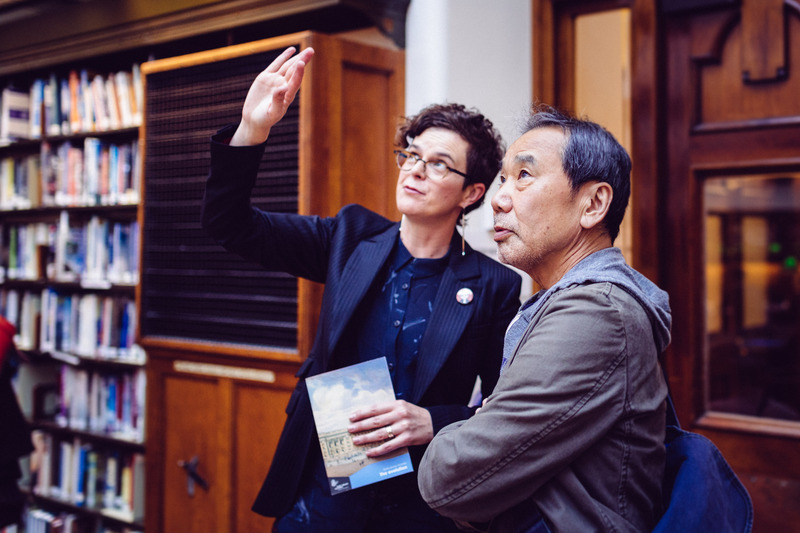 Justine Hyde, the Library’s Director of Services and Experience, led Mr Murakami through the iconic La Trobe Reading Room, exhibition spaces and behind the scenes. Justine Hyde giving a behind the scenes tour. 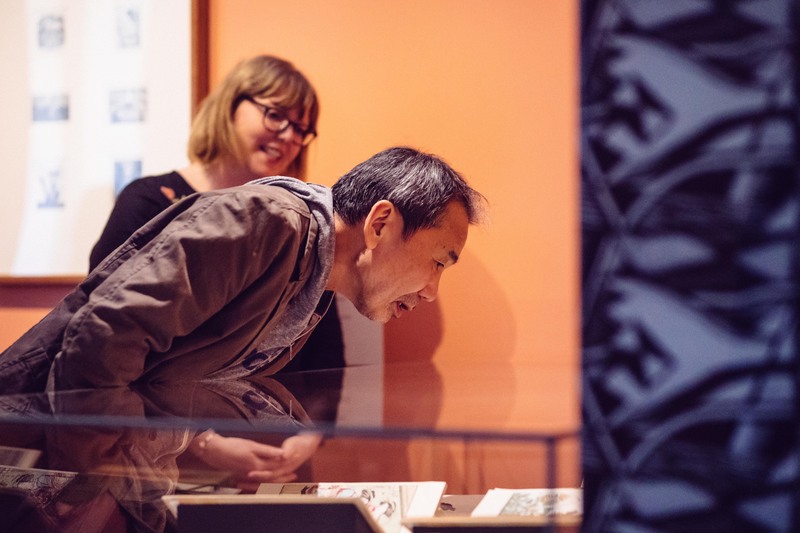 Mr Murakami was shown through the World of the Book exhibition by Rare Books Librarian Anna Welch, viewing a number of treasures on show including beautiful Japanese woodblock printed books and first editions of Jack Kerouac’s works, of whom Mr Murakami is a big fan. A glimpse into the exciting World of the Book exhibition. 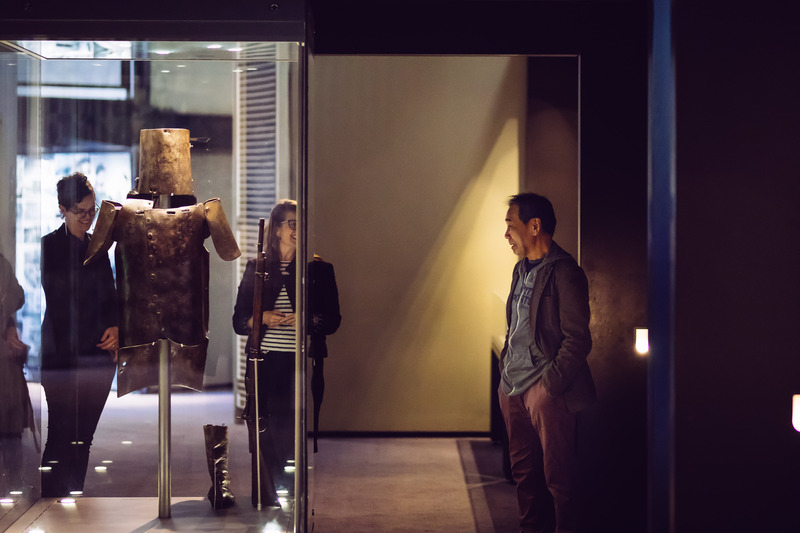 Mr Murakami was interested to learn more about Victoria’s history while he toured the Changing Face of Victoria exhibition with Lead Curator Carolyn Fraser. As a long distance runner, he was keen to see highlights from Victoria’s sporting history, and was also familiar with the armour belonging to our most famous bushranger, Ned Kelly. A visit with Ned Kelly in the Changing Face of Victoria exhibition. In the Library’s Conservation Department, Senior Conservator Marika Kocsis provided an insight into how paper imported from Japan is used for delicate conservation repairs. State Library Victoria has the most significant collection of Murakami works held in any library in Australia – a complete set of first editions in Japanese and English donated last year by Judge Graham Anderson. Comprising nearly 90 volumes, it forms part of the Graham and Anita Anderson collection of modern literary first editions. Noticeably taken aback by the sheer size of the collection, Mr Murakami generously signed a selection of his books. 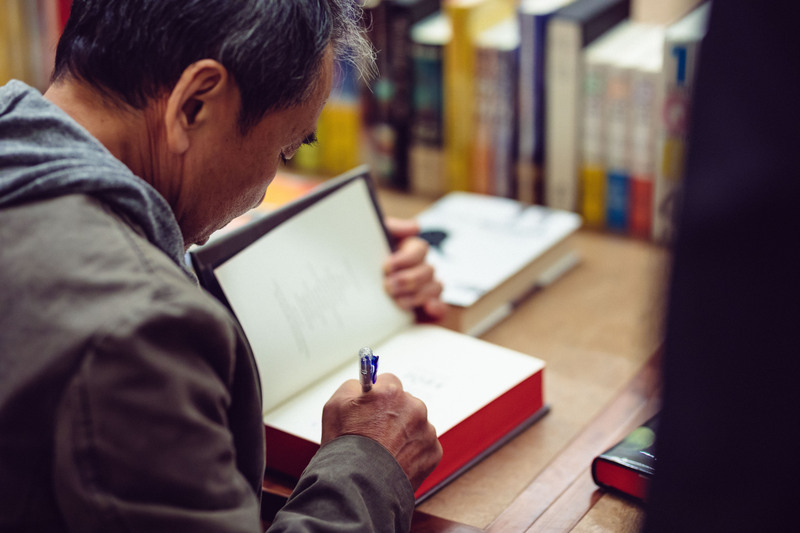 Haruki Murakami signing his books from the State Library Victoria collection. Didn’t know that! Seems a bit out of place.. very different worlds they seem to come from and create. This is wonderful! I love Murakami’s works. I think he would have enjoyed the SLV. It’s an inspiring place. Amazing writer. I would have loved you meet him! or go for a run alongside him. Would love to have met him, I have only recently become aware of his writing and am utterly enamoured. That’s great! I will visit the library to see the Murakami books. I’m sorry I didn’t know he was visiting Australia. Thank you for reporting on Muralami’s visit. The library is fortunate to have such a valuable collection. big fan of his novels. if only I stayed in Melbourne for a little bit longer. How fantastic to have Haruki Murakami visit. I have enjoyed reading some of his stories , which often leave visual images and questions in my mind. Very enjoyable. Terrific! I love Murakami’s novels. I believe he would have enjoyed the SLV. What a pity that I couldn’t meet him there. I was told yesterday that Haruki Murakami had visited Melbourne, really great I thought. His books never cease to amaze me! I live in hope that one more will be made into movies. 1Q84 a trilogy, Aomame &Tengo in fact all the characters are sensational.